We’re back for season 2! And the ‘stache – mine, anyway – is in not-so-full effect. Before I begin, a brief programming note. While I’ll continue to analyze each night’s game, I won’t be making as many videos this season. I’ll still do at least one a week, focused on the scenario(s) I found most complicated. 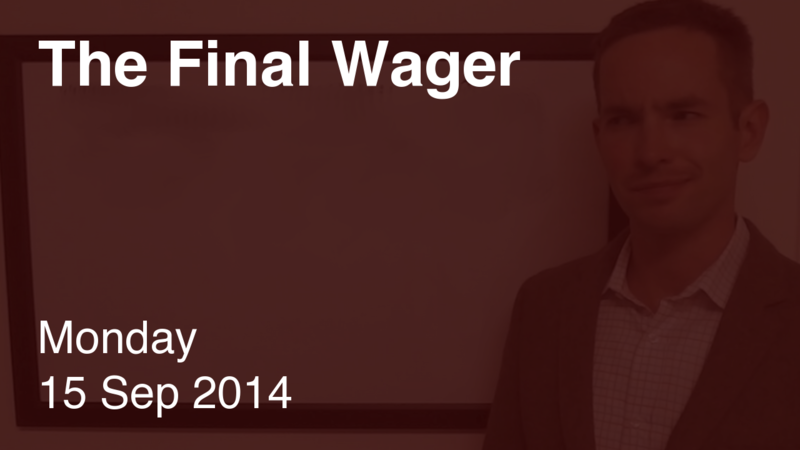 Of course, if someone does something really stupid, you can expect the full visual wrath of The Final Wager. We’re easing back in to the math with a simple situation. 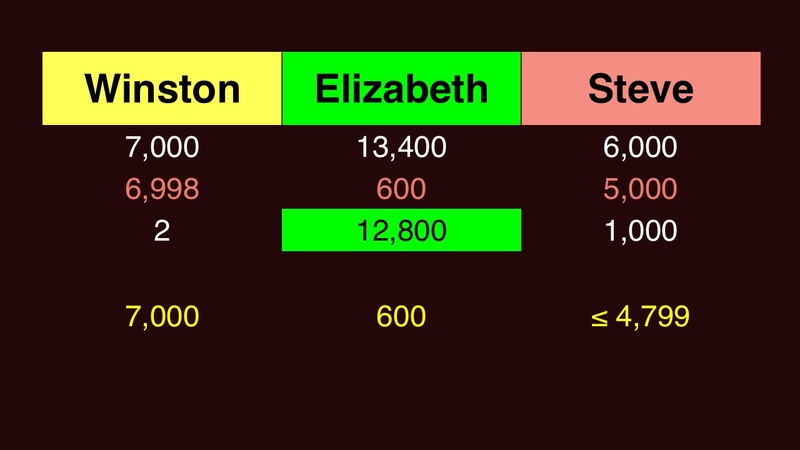 Elizabeth should wager 600 to cover a double-up by Winston. Winston needs to get it right to have a shot, so he might as well wager everything. At a bare minimum, he’ll have to put up 5,800. Steve can’t catch Elizabeth, so he should focus on second. Winston will have at most 1,200 on a miss. Steve should aim to have no less than 1,201 – remember, a tie for second goes to the player who had the lead going into Final. Steve’s maximum, therefore, is 4,799. Technically, Steve should wager at least 2,001 to cover an “unsafe” wager by Winston, but the likelihood Winston won’t go for the win is (nearly) non-existent. What the what?! A tie wager on the first day? Someone did her homework. Too bad Winston did not lose by that $2. I enjoy seeing improper wagering punished immediately. Glad you’re back, and recommend adding a goatee. The solo ‘stache is hard to pull off IMHO. In the first part of the text, you have Winston’s and Steve’s names switched.